I have been using a Rangemaster AM1000 transmitter for almost five years now, and not a week goes by where someone doesn’t call or send an e-mail asking how I enjoy using it, or if the unit is worth the money that I paid for it. I hope to answer all these questions and more here in this document. I have a B.Sc. in Communications from Appalachian State University, and for fifteen years I was employed as an engineer/project manager by Carolina Telephone (Sprint), the local telephone company. I have also worked in broadcast TV and radio from time-to-time as both talent and repairman. So I have a pretty good engineering and electronics background. 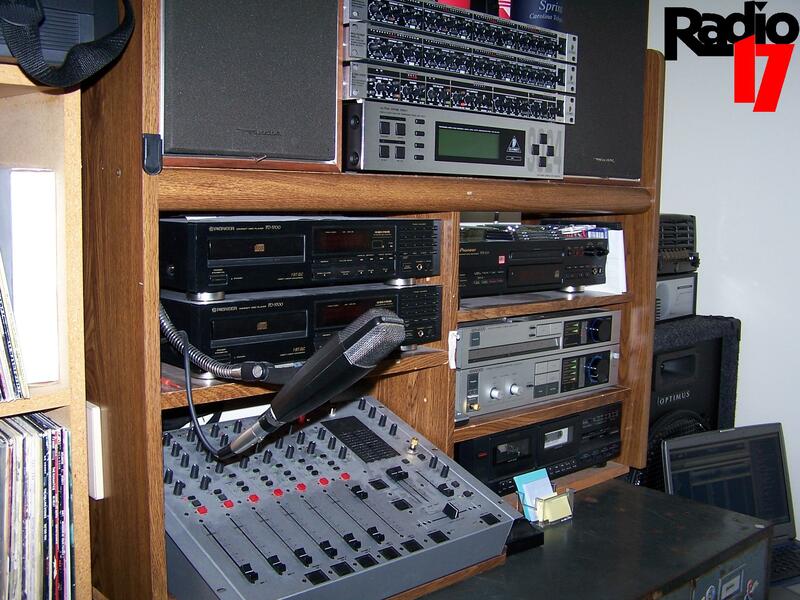 In 2000 I decided to go back and scratch that radio itch with a low power radio station that I could call my own. My first attempt at low power AM radio actually began back in the 80’s when I was a college student in Boone, NC. 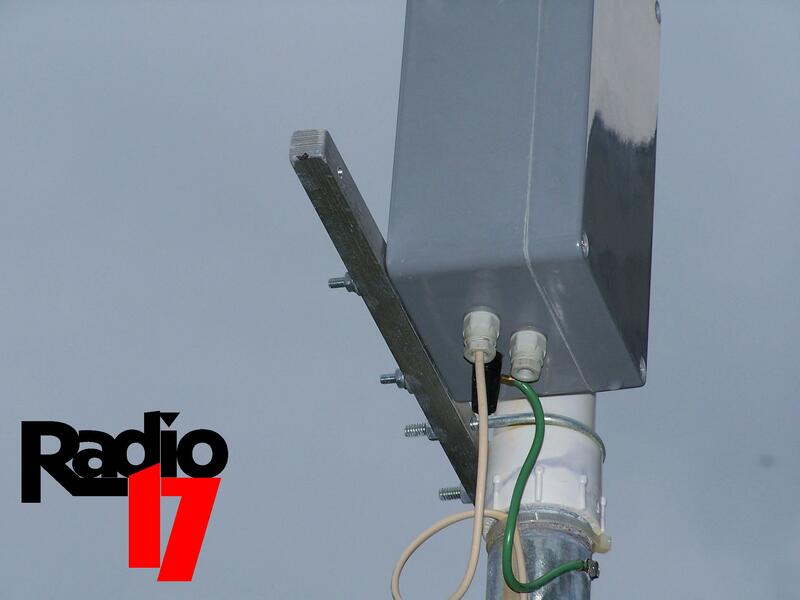 Using a kit-built Panaxis AM5 transmitter, WBVR – Wonderful Bavarian Village Radio was born. Using a random long-wire and one-tenth watt, “The Beaver” got out about ¼ mile day and night on AM 1200. But for this new attempt at unlicensed AM, I borrowed a friend’s Ramsey AM25 and tuned it to 1700. I didn’t like the sound or range, and one day while retuning the unit I reversed the power polarity and blew it to pieces. Fortunately my friend forgave me for killing his unit, but I still wasn’t on the air yet. And that itch had to be scratched. Ebay came to my rescue. I bid on, and won, a really nice early 70’s LPB 6 watt AM transmitter. It sounded really warm and had that modulation ‘rattle’ in the cabinet that I was used to hearing at different AM stations where I had worked. It came with a fresh set of tubes and two crystals: 810 and 1610. Since 1610 was used by real estate firms all over town, I chose 810. It is an unbelievably clear day-time channel here. (WCEC just up the road gave up their license for 810 when they were awarded an FM allotment by the FCC.) At night WGY obliterates anything there, so I decided to go day-time only. I connected the transmitter to a dummy load, but ran a 10ft wire from the load’s core. I was taking a seriously educated guess that I couldn’t be putting out more than one-tenth watt, because my signal carried no more than ¼ mile. And man did that little LPB put out some heat!! You could really reheat food on that little box. As I said before, building a small radio station in my home was purely for enjoyment – I had an itch to scratch. I was not into this for the money. 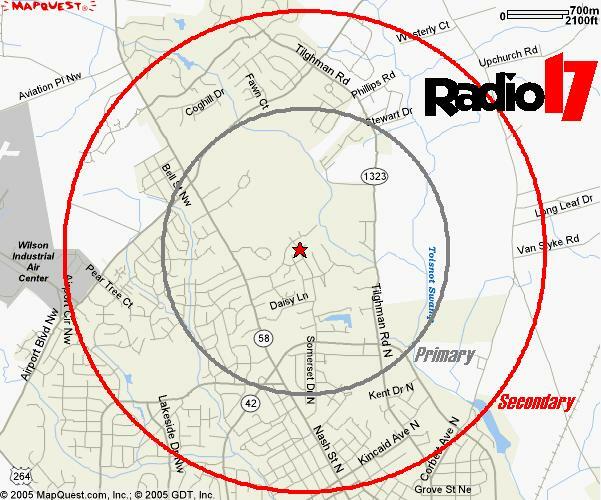 But for multiple reasons, I was not enjoying operating my new station, AM 810 The Rocket. My studio setup was great. My music was rockin’ oldies (They call it ‘Jack FM’ now in the business… ‘been there - done that.) So what was my problem with The Rocket? It was that cool retro transmitter. It wasn’t really so cool after all. A) It was HOT! The control room was sweltering and uncomfortable. B) The power bill went WAY UP. At least $30 for power that heated tubes and went into a dummy load. C) One-fourth mile was not enough for all the effort. E) Was I really legal? I had no way of knowing. Plus, I had just put in an application for an LPFM radio station, and I didn’t want to jeopardize my standing with the FCC. I even made sure that my little GMRS two-ways were licensed. So I signed off The Rocket and started hunting for the perfect FCC-legal low power AM transmitter. It had to be FCC-Certified as Title 47.15.29 accepted, complete with affixed labeling. Meaning that my station’s transmitter would be OK in the eyes of the law. I expect the signal to be heard clearly at least ½ mile away during the day. The design should be rugged. It must operate 24hrs a day in all types of weather without fail or going out of tolerance. Audio should be crisp, loud, and without hum or frequency modulation. Basically the exact opposite of many ‘cheap’ kit units. Since the unit will mount outside, it must be aesthetically pleasing to the neighbors. And my wife must approve of its appearance. It must be easy to mount, connect, and tune. The company that sells it to me should be able to service it promptly, and reply quickly if I have questions. And finally, the transmitter should be affordable. I’ll pay a premium for meeting all of the above needs, but not over one thousand dollars. In 2000, only one transmitter met all of those qualifications – The Hamilton AM1000. It is now known as the Rangemaster AM1000, but it is the exact same unit, with a new name. I have never actually spoken with Keith Hamilton, but I have had numerous conversations with him via email and message boards. He’s a class act, no ego, and really great to do business with. Before you email me about this, let me go ahead and tell you that I did not get a discount on my unit for writing this review. I am not going to get any compensation from Keith or anyone else. I don’t sell his units, nor can I afford to buy another one. So what follows is honest opinion. Really. Can easily be heard on automobile radios at 1 mile and in-home between ¼ and ½ mile. Stops on auto scan around 3/8 mile. Built like a BRICK. Two different lightening strikes have destroyed one of my TV’s, the underground dog fence, a telephone, an audio processor, and all of the lady-across-the-street’s computers. But the Rangemaster keeps going, rain or shine. The sound is bright, basey, loud and crisp. Easily modulates 120% without distortion or clipping. No hum or FM artifacts. One weak harmonic at 3400kHz. It looks like a utility box. It’s not ugly. But more importantly, neither my wife nor neighbors care that I put it up. Mounted and tuned within 1 hour. It took longer to run the audio/power wire under the house. Only four adjustments: audio, power, coil jump, and capacitance. Keith is honest and a pleasure to do business with. He can put me down as a reference any day. You get what you pay for. It isn’t cheap, but it isn’t cheaply made either. Some folks are afraid of wall-warts (those square AC adapters that plug into the wall). I am one of them. The Rangemaster came packed with one which I have never used. Instead, I am using a tightly regulated 13.8vDC power supply with the transmitter. The extra voltage did not raise the output power, because I tuned it with a meter at the transmitter. If your Rangemaster hums, it could be your audio gear, a ground loop, or the standard wall-wart. You have to pay extra for the mounting bracket. It isn’t expensive, but you’ll want it if you decide to mast-mount the unit. There’s a good picture of the mounting bracket at my installation below. You have to visit Radioshack to get a whip. Not too big of a deal, but they don’t have a catalog anymore, so nobody there knows what a 102” CB whip is. Plus they keep trying to hard sell me wireless phones, Dish Network, and other garbage that I already have. Whatever happened to the Battery Club and those cool car stereos? What some may consider a shortcoming, I consider a great positive. The Rangemaster is not equipped with a compressor, limiter, auto-gain, or clipper. You’ll have to supply your own. I have always considered processing crucial to a station’s audio signature. Like jingles and announcers, your ‘sound’ is your image. I like a level AGC feeding a hard knee compressor. And I already own the gear to give me that punch on the air, so built-in audio chips would be wasted junk. IMPORTANTà The Rangemaster handles ALL OF THE AUDIO ENERGY I GIVE IT. Car stereos and boom-boxes start to bleed artifacts before the transmitter clips or goes incoherent. If you carefully tune the Rangemaster, then you will never be disappointed with it’s fidelity. Four other great things about the lack of onboard processing: it lowers power consumption (solar? ), decreases part count (increasing durability), processing/AGC needs to be near the audio source anyway (reduces hum), and you have greater freedom for a highly tailored sound. I replaced the unit’s whip with a 1” outer diameter copper pipe. This dropped the antenna’s capacitance and improved the audio frequency response and loudness. It did not really increase the range, just the sound. My wife couldn’t tell a difference, but I could. I then added a ‘top hat’ to the copper pipe. This increased the signal strength ever so slightly. No more than 100yds on a car auto scan. And the third and final improvement was the addition of three 10ft copper radials terminating into 8ft ground stakes which have 3 drops of water per minute added by a network of garden hoses and control valves. This last change VASTLY improved DX (distance) coverage. The Rocket is now a DX catch within 4 miles. Audio and-near station coverage did not change. After each of these three changes, I made sure to readjust the transmitter, keeping it within the legal 100mw limit. (One-Tenth Watt). The top-hat has been an issue of discussion on many forums. Is it legal or not. I really don’t know. But I think that since the length of the pipe is still less than 10ft, then I should be OK. The hat didn’t add much signal, and it was a hassle to build. Take my advice: don’t worry with it. As a matter of fact, if you were to do anything, just make sure that you have a good ground system, even if its just one 8ft copper ground stake. You’ll get better coverage, better frequency response, and lightning/static protection. Can You Turn The Power Up? I tested the unit with the power above 100mw. It will go to 500mw with the audio peaks falling below 100% modulation around 250mw. So to answer your question, the answer is: No. The Rangemaster is carefully designed to operate with best sound around 100mw. You cannot crank it up without destroying it’s modulation. And that’s the beauty of it. 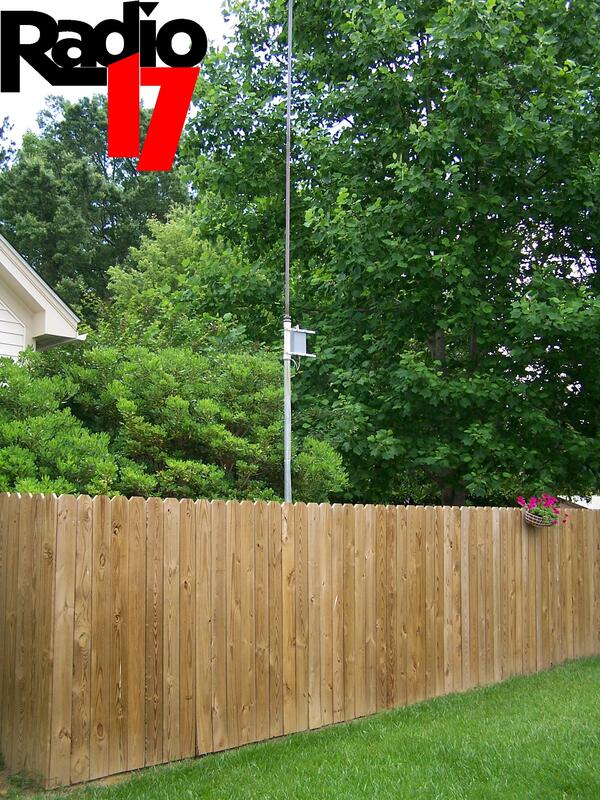 If the FCC comes to your station and sees the Rangemaster, and verifies that your antenna/ground length is around 10ft, then you won’t even hear a ring of the doorbell. To improve your signal, work on the ground system or go with a copper pipe aerial (shown below). College / University Student Radio – If your former student station has been hijacked by NPR, then get some funds together and get one of these. If your college has never had a student station, then you don’t know what you’re missing. Wake Forest University’s WAKE is cable FM - they could easily place a few of these around the perimeter of the campus (getting the signal from cable FM tuners) and serve northern Winston-Salem. Barton College has never had a radio station of any type, and the school’s small footprint means one Rangemaster should easily cover all of the dorm rooms. 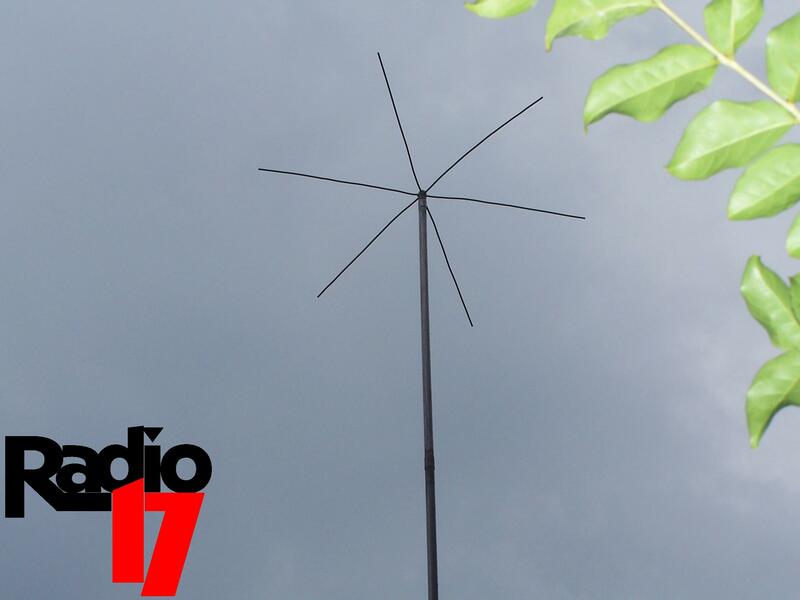 Translator / Satel-lator - If you are in love with a distant station that you can barely hear, then get a high gain antenna, a good tuner, and feed the audio into the Rangemaster. You’ll be able to hear the formerly weak station clearly all over the place. Religious organizations might want to buy a lot of these units to put signals into areas where the FM band is full. A perfect example would be adding K-Love and/or Air1 to a metropolitan college by building a tower just outside the campus. Shopping Districts – Tell everybody about how good your mall is, or that downtown is still alive. Don’t forget to buy a digital recorder that repeats the message. Campground Radio – Fun for the campers! RV Parks – Tell your visitors about the area, sell some ads! 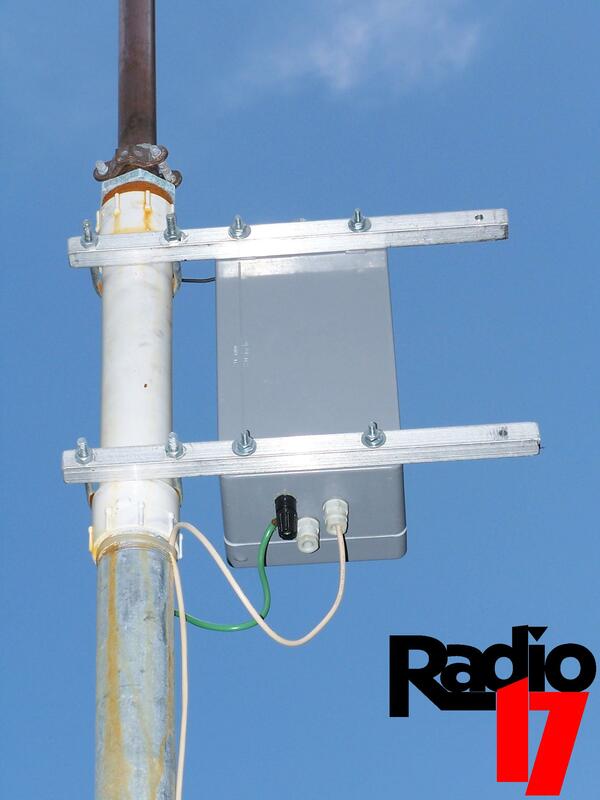 Resort Areas – An ideal application for low-power radio. Everyone is tightly packed into one spot and with readily-available vacation cash. The Rangemaster’s broadcast serves as an exciting shopping/dining guide. Just put out brochures, and start selling advertising. Historic Sites – In addition to facts, tell everyone about visiting hours, the gift shop, and other things to do in the area. Ferry Parking Areas – On the way over to Ocracoke, Bald Head Island, or whatever other place over the water, people sit and wait for the boat – YOU have a CAPTIVE audience. They are just sitting there in their cars. Put up a sign, and tell them what’s happening at their destination! Event Parking (Fairs, Sports, Concerts) – Broadcast rules, regulations, advertising, etc. In-Venue Play-by-Play Broadcast – Modern radio now has an awful delay due to digital compression and new profanity-delay gear. A Rangemaster will return your station’s ability to serve patrons at the ballgame. Event Language Translation – Billy Graham’s organization has been doing this sort of thing for years. Using a Rangemaster, now your group can invite the local Spanish speaking population to join in. Just make sure that you have a good interpreter and lots of ‘Walkman’ type radios available when you fire up the transmitter. I guess by now that you can tell - I’m impressed by the Rangemaster AM1000. But I have been tinkering with other low power AM gear since 1985. The biggest thing going for the Rangemaster that no one else listed below can claim is A) Its NOT a kit, and B) Its FCC-certified. If you build one of the kits below, then it is your responsibility to make sure that it isn’t overpowered or causing harmful interference. The FCC will hold you or your organization responsible for breaking the law, not the folks that sold you the kit. That’s what I like about FCC-Certified gear - I have nothing that measures 100mw output! SStran – Score 9 I really like this unit. It’s clean, loud, punchy and has a built-in audio processor. It is frequency agile. Like the other kits below, you have to place an ugly tuning coil on your mast. If this company would go through the red tape of having it certified, and then selling it ready built-with a built in tuning system, I can honestly say that the SStran would score equal to or better than the Rangemaster. I like it. But if you don’t have the time to tinker with building the kit or fabricating a decent antenna, then forget it. Go with the Rangemaster. Panaxis AM100 – Score 7 I bought this kit from Ernie back in the 80s when Long Distance was 25cents a minute. I still love its simple design and clean output. It is VERY LOUD and has a nifty way of keeping your modulation peaks well over 100%. The kit is crystal-tuned like the Rangemaster. Before the Rangemaster and SStran came along, I considered the AM100 the best there was. Northcountry AM88 – Score 7 Frequency agile. Built-in limiter (not a compressor). Does Long Wave and Morse Code. The cleanest kit transmitter that I have ever heard – no harmonics at all. Like the Ramsey AM 25 below, it doesn’t modulate peaks over 100%, so the perceivable coverage is lots less than the Rangemaster, SStran, and AM100. I still like it. Ramsey AM25 – Score 4 Frequency agile. Easy to build. BUT – low modulation, lots of FM artifacts, and horrible fidelity if not perfectly matched to an antenna. This isn’t the best kit out there, but it isn’t the worst either. Ramsey should clean up the audio a little bit and try again. They’re a good company, and I know that they can do better. I plan to pay BMI the yearly fee as soon as I go on the air with my final music/sports format. I’m still working on the software. In the meantime, I am running weather or some other stuff on AM 1700 here in Wilson. There’s a map of my coverage area below. If you’re driving through, give me a listen. I have just printed a few QSL cards, so be sure you tell me what you hear and I’ll snail mail it to you. My email address is on my main page. Photo – The back of the Rangemaster AM1000 and the optional mounting bracket. Photo – The bottom of the transmitter, audio/power cable, and ground wire. Photo – The top of the transmitter, including connection to the 10ft copper mast. Photo – The mast’s top hat. I wouldn’t add one, you don’t get much more coverage. 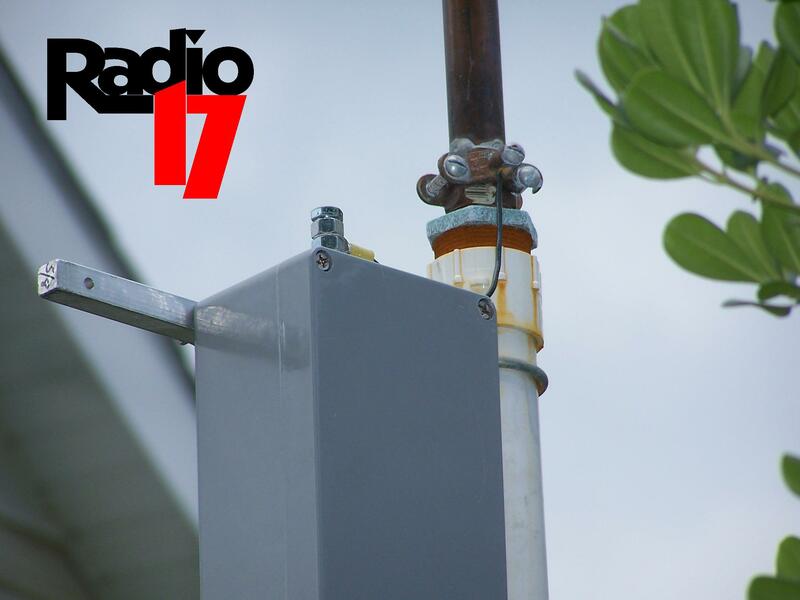 Photo – The wooden picket fence that supports the mounting pole, transmitter, and mast. Be sure you get your neighbor’s permission to do this! 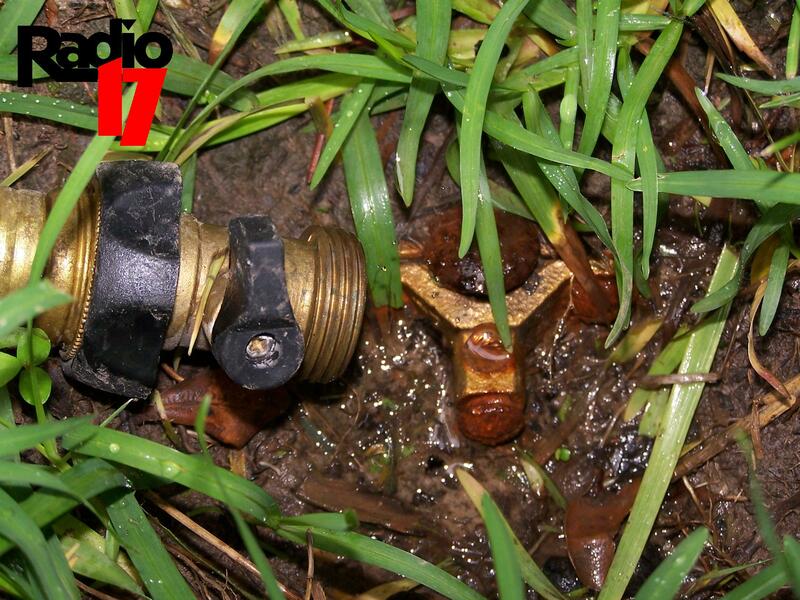 Photo – Ground stake below the transmitter. 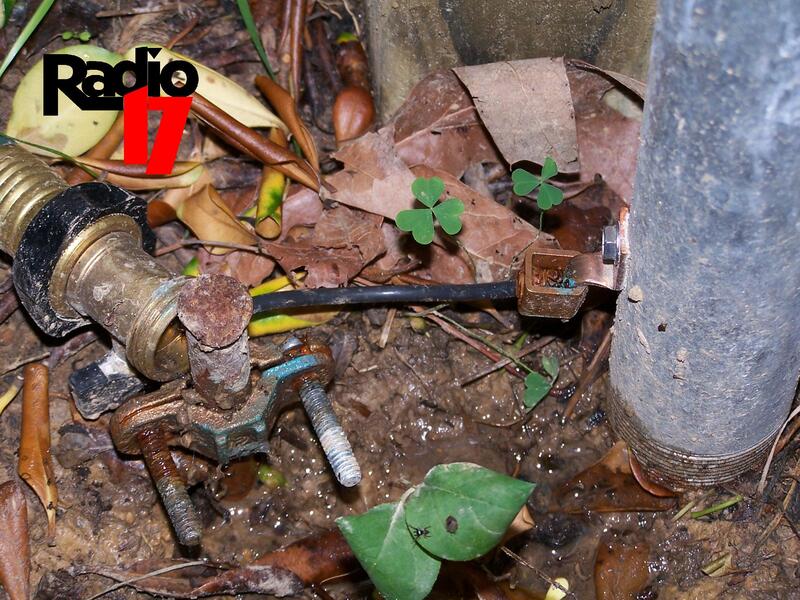 Photo – A ground stake at the end of one of the copper radials.